So, birthdays, when they roll around, usually come with certain expectations: you will, without a doubt, be another year older. There is always that. There are usually (hopefully) some pretty stellar presents involved, an overwhelming sense of goodwill in your general direction (right?) and definitely, absolutely, of course, there is cake. It's usually a cake, sure, typically one that's especially gleaming with celebratory sheen, piled high with frosting and sprinkles and your name and new age spelled out in candy or something. Right? Listen, nothing wrong with THAT. 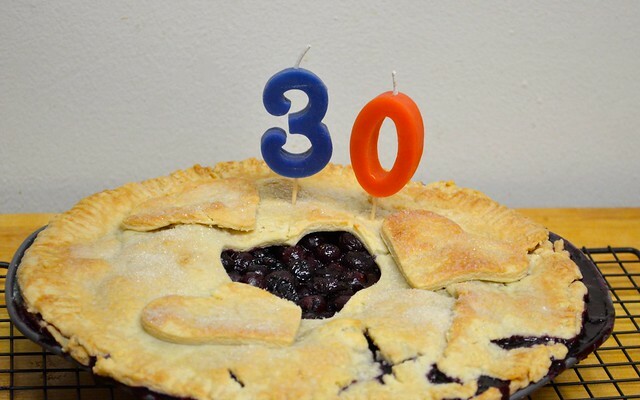 Even of the vegan variety, I've had some pretty passable (okay, spectacular) versions of the traditional birthday cake. 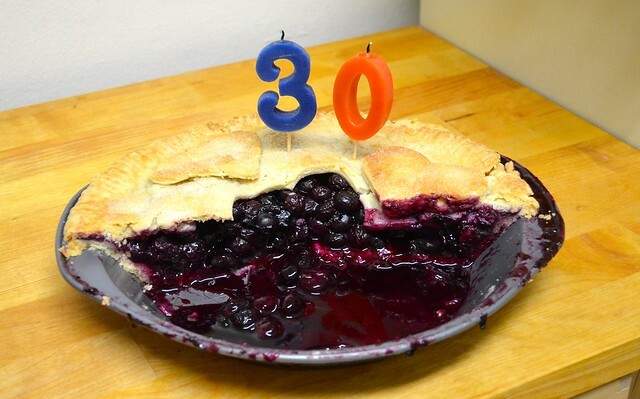 But, when you turn thirty and when you do it so CUTELY, I will try my damnedest to make you the best blueberry pie you've ever had in your thirty years on this pie-eating earth. Oh, and it also won't have a speck of dairy in it. 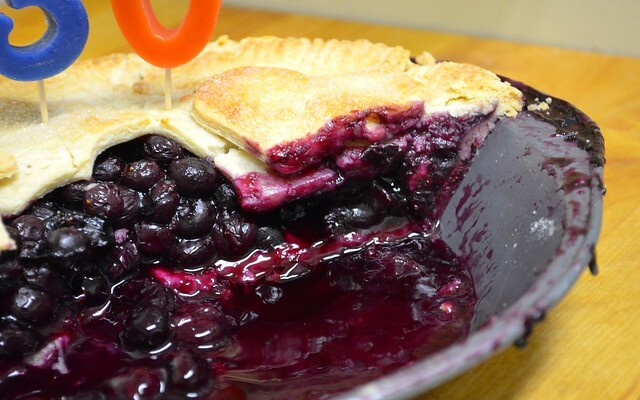 WAIT: pie without butter in the crust? Or, as called for in many recipes, lard? Nope. And definitely nope to that second one. Not to be a huge hater (and I'm usually not, but): ew. I've definitely had vegan pie before that didn't seem to be lacking the traditional crust texture that you usually look for in a good pie. Usually these are made with vegetable shortening. I'm not against vegetable shortening, but I'm also kind of skeptical about it. It's not like it's made out of pretty green vegetables; more like hyper-processed soy. 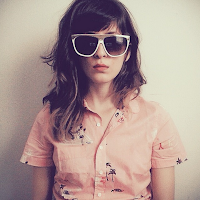 I don't know, it's kind of like calling vegan cheese "cheese" - I raise my eyebrows (yes, both) to that one. I'm not trying to make your desserts healthy, don't worry. But I am pretty interested in certain swaps with a little more nutritional value, because, why not? You might as well sneak it in where you can, and if that means a little goodness goes hand in hand with dessert, I'm pretty sure that's the ultimate definition of a bonus. Enter: coconut oil. Touting tons of inherent health benefits, coconut oil is the perfect substitute without compromising any of the anticipated pie goodness. 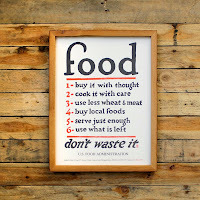 But, I have to say this first because I think a lot of folks who are unfamiliar with this (genius! life-saving!) substance are thinking it - don't worry, your pie won't taste like it came from the tropics. While the oil definitely has a slight scent, it has almost no flavor and won't affect the ultimate outcome of your dish. What it does have is a great, butter-like texture when it's at room temperature, which is exactly why it's perfect for replicating the perfect pie crust. A quick note on temperature, though: if you're baking in a hot, stuffy apartment (hand raised here), there's a chance your coconut oil has liquified. No problem: just stash it in the fridge for 40 minutes to an hour until it has hardened up. 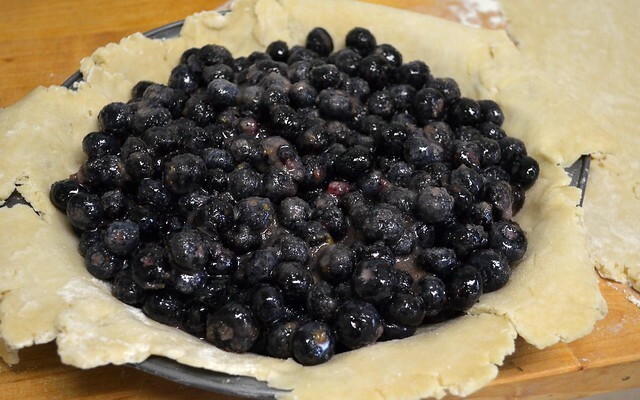 A quick tip on this is that you should measure out your needed amount before refrigerating. Once it's solidified, it will be much harder to break up without melting it back down. Which just wouldn't make any sense at all. 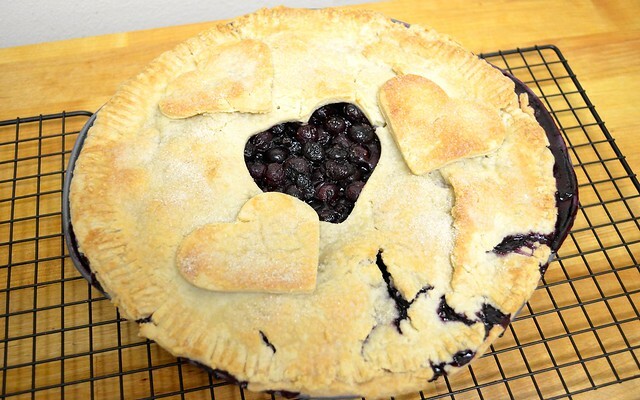 This is for one 9-inch pie crust. To have enough for a top and bottom, simply double the recipe. Preheat your oven to 375 degrees. In the bowl of a food processor, pulse your flour, salt and sugar until evenly combined. Add your coconut oil and continue pulse until crumbly. Add your water, slowly and while still pulsing, until your dough begins to come together. Stop when the dough starts sticking and remove from the bowl. 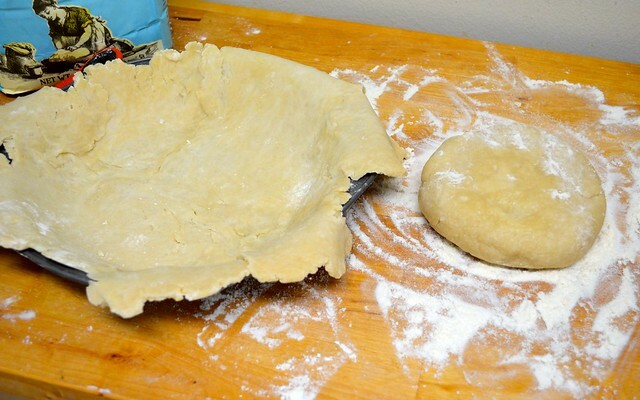 Transfer to a floured service and roll immediately (the dough can also be refrigerated or frozen if you aren't ready to use it right away) - repeat for the second 9-inch crust. 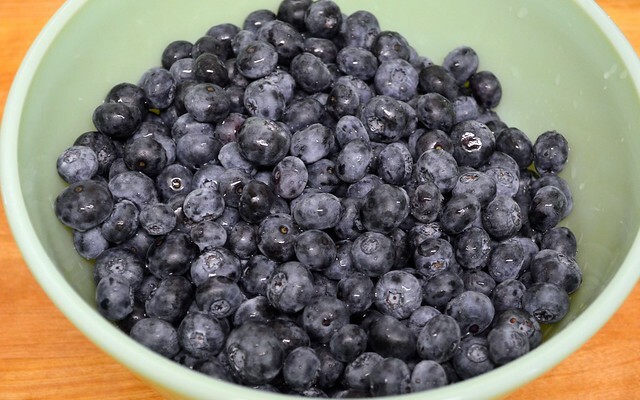 In a large bowl, combine your blueberries and lemon juice, tossing to coat evenly. Add your sugar, corn starch, lemon zest and cinnamon. Toss together (with your hands is more fun, just saying) until the fruit looks glossy and smooth and the sugar grit is mostly gone. 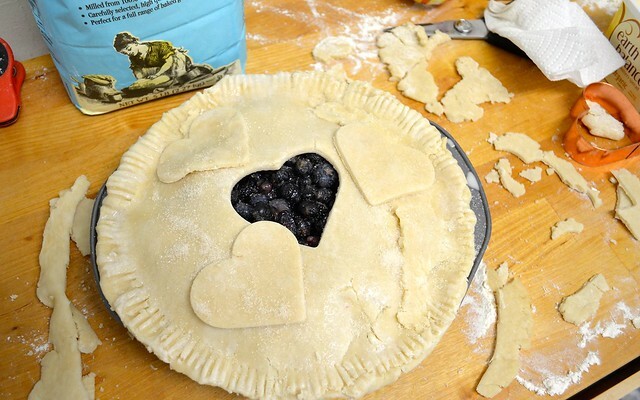 Transfer to your prepared pie crust. How you decide to do the top layer is totally up to you, but as long as there are some vents (or okay, huge heart shaped cut-outs) so steam can escape, you'll be good. 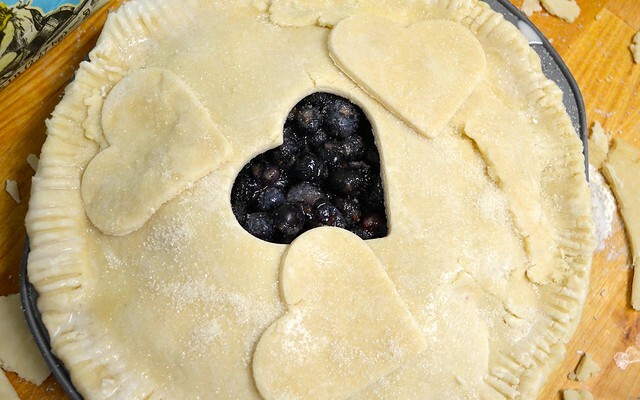 Get creative - there are some pretty pies out there. Pop your pie in the oven (oh my gosh, on a baking sheet, please, beentheredonethat and it SUCKSSSS) for about 50 minutes to an hour or until the crust is gorgeously golden and the fruit is bubbly and the filling oozy. Oozy is exactly what I look for in a pie, every time. What can I say? 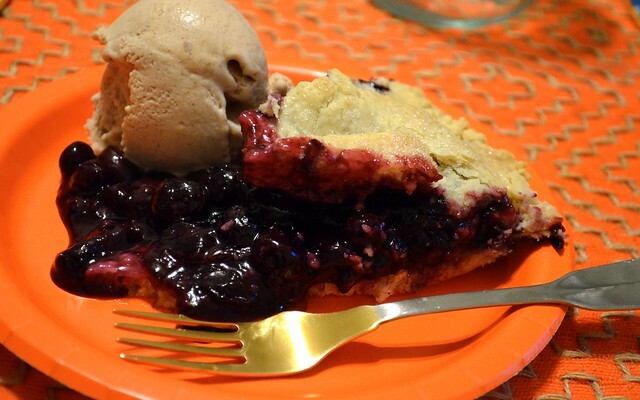 This crust shortcut to vegan-ville did the trick. I can't say I had any major doubts, but I think it delivered even more than I expected. Any leftovers, should you have them, can be stored on the countertop (well covered) for one day and then transferred to the fridge. Also, something tells me this would go great with some (vegan) cinnamon ice cream.